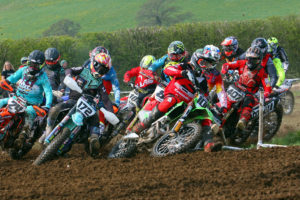 A fantastic entry of Girl racers gathered at the Severn Valley venue of Wroxton for Round 2 of the UK Girls Motocross Nationals Championships. Tanyaradzwa Muzindaa came all the way from Tanzania to compete and brought the BBC tv cameras with her. was Lottie Taylor who collected a stunning 5 ride win maximum on her way to the overall and was followed home of each occasion by Elizabeth Ridout, with Miley Hogdson in third. The battles were intense in the Junior class with 3 different riders taking the chequered flag over the weekend. Ellie Allsopp with 2 race wins went on to take the overall ahead of another double race winner Ivy Cooper who came 2nd. In third was Katie Morgan with a run of three second places to open her weekend and the remaining race winner Ebony Brown came 4th overall. Grace Richards rode well throughout the weekend to take the win in the Small Wheel 85’s with 4 race wins, the only rider to beat her being Jaysi Austin who only completed two rides. In second overall was Rheanna Morgan – Rogers with Tanyaradzwa Muzinda all the way from Zimbabwe in third. There was a great line up of Big Wheel 85’s with the No1 spot going to Bethany Allison who was only beaten once all weekend by the second place finisher Ria Truman, Abbie Pittaway was third. The Senior class also enjoyed a good entry with Eleanor Calby pulling out the stops to win the first 3 races ahead of Taylor Scott who got her revenge in the final two races to take those race wins for second overall behind Calby with Molly Wernham third. Ciara Robertson was in fantastic form in the open class storming to a immaculate 5 ride maximum ahead of second placed Rhianne Barker with Louise Powell taking third. The AMX class was stacked out with tremendous talent which makes Amie Goodlad’s maximum even more remarkable and a tremendous overall victory. Katie Walker was second, edging out third place finisher Marni Saunders by just two points. In all another awesome weekend for the UK Girl Nationals showing that there is some amazing talent in the UK ranks for years to come.